Together we will explore the question, “Who am I becoming?” in these later years of life. Foucault, a French philosopher, claims, “Living is a process of becoming; it is becoming what we have never been before. Becoming then has no endpoint, but rather a direction we are always evolving toward.” As we continue to craft our stories of living well, what does a contemplative approach to grief and dying well look like? Crafting is accessible to everyone; it involves deliberate action rather than passive acceptance of life’s circumstances; it is a creative process that is shaped by stories, meanings, actions and rituals. Like artists, we mix different hues of colors, then add thick and fine brush strokes of our particular preferences onto a canvas provided by our cultural worldview and the conventions we are expected to follow. Contemplative crafting becomes an ethical task, within a relational community, of designing a pathway governed by what we value, stand for and hold dear in living well and in the preparation for dying and death. 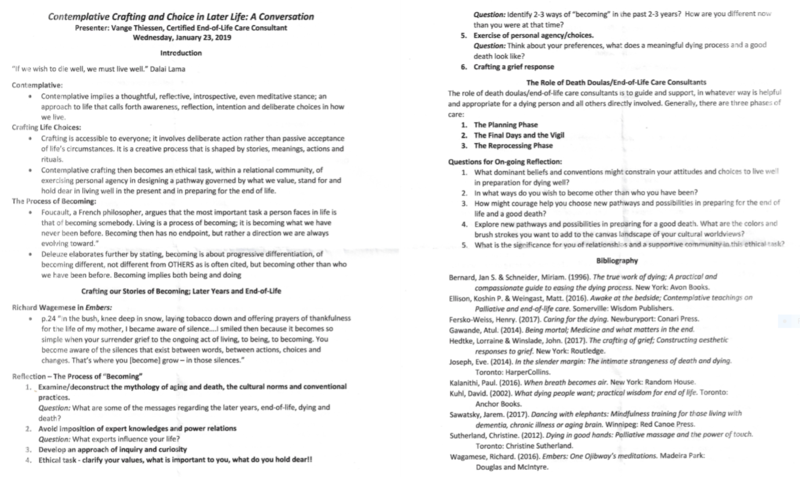 What dominant beliefs and conventions might constrain your attitudes and choices to live well in preparation for dying well? How might courage help you choose new pathways and possibilities in preparing for the end of life and a good death? As you continue the crafting of life choices, in what ways do you wish to become other than who you have been? ​Aging Series – “Dying Well” class on April 25th, at Highland Community Church from 10-11:30am facilitated by Joy Warkentin, RN. The Conversation will center around options for the aging person, especially pertaining to health choices.